I love candles and the atmosphere in my home when I light them. However, ever since I developed Scent Sensitivity Syndrome, I can’t have them in my house. The fragrance oils give me migraines. I’m grateful I have 2 friends (Anne Marie of Sparklefly Candles and Theresa of Great South Bay Candles) who were willing to make me custom unscented candles. They are lovely and set a nice atmosphere in my home, but I do miss the fragrance. I decided to experiment, cause that’s what I love to do! I lit both candles and let them burn. Once I had a pool of wax, I added a few drops of lavender essential oil to the liquid wax. At first, I added it too close to the flame and that generated some black smoke. That got me a little nervous, I know some essential oils have a low flash point and are flammable. I tried again, this time dropping it on the outer fringe of the wax. In a few minutes the whole house smelled like lavender. I did need to “refresh” both candles after a while, so I’m guessing the “throw” of the essential oil isn’t strong. But I’m happy I’m able to enjoy a scented candle again. 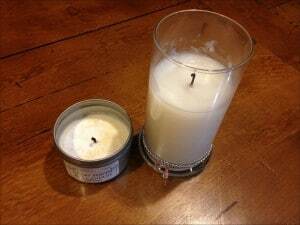 Do you know of someone who makes a 100% essential oil candle? What about making them yourself? You could reuse the same container over and over – a bag of soy wax would last you a really long time!